In certain scenarios, you may want to restrict or prevent a certain carrier from displaying to a specific state or country. 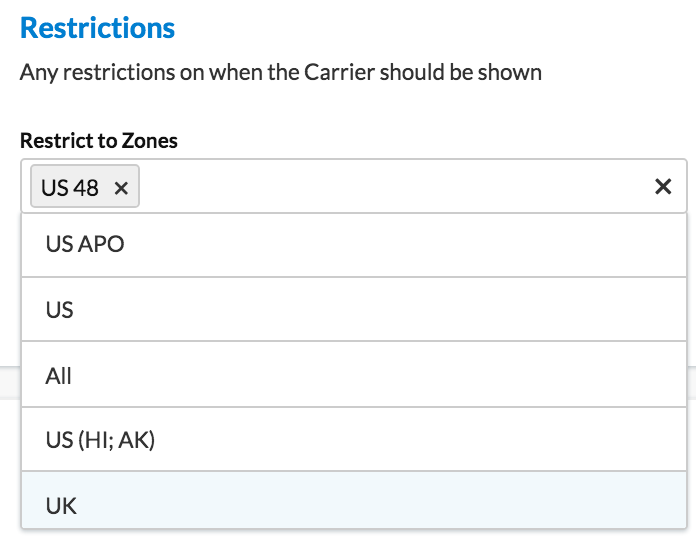 Restricting carriers can be done directly in the carrier settings while preventing or hiding methods for zones is accomplished via carrier rules. Both scenarios with instructions are listed below. When you set up a carrier you may want to only offer that carrier for specific countries, states or regions, or even specific ZIP or post codes. On that carrier, in the Optional panel, you’ll find a Restrict to Zones field. Select the dropdown, and choose your Zone or press ‘Add New’ to create one. Ensure the Zone in this selected in the dropdown and save your carrier. You may use UPS for shipping to the US48. You don’t need a Carrier Rule to accomplish this, you can set up this restriction directly on the carrier as listed below. This assumes that you’ve defined at least a UPS carrier. As an alternative, you may want to hide a particular carrier for specific countries, states or regions, or even specific ZIP or post codes. A good way to conceptualize this difference is understanding that carriers are available to all zones by default. Restricting carriers is easy as instructed above but excluding zones will require a carrier rule. This assumes that you’ve defined at least 1 carrier. Now if a customer enters an address in that particular zone, the selected methods won’t be shown as an option preventing unnecessary returns, saving you customer service hours and making your customers happier. You want to restrict “UPS ground” from shipping to any city in “Alaska” however, you still want the other methods you’ve selected within the UPS carrier to ship there. Define an Alaska zone if you haven’t. See Creating a Zone steps here. Go to the Shipping Methods panel and choose the methods you want to hide with +Add Methods under Live/Custom Shipping Methods Assigned. For this example, “UPS Ground” will be the method we will be using. Go to the Conditions Panel, under Apply to Zones, set the Zone you don’t ship the method to. For this example, Alaska is the zone to restrict. If you want to restrict more zones, simply just select other ones. On the Actions panel, select “Hide Shipping Methods” under Action to Perform and then save the rule. Once you’ve done all of the mentioned above, Alaska zone will no longer get rates from “UPS Ground”.